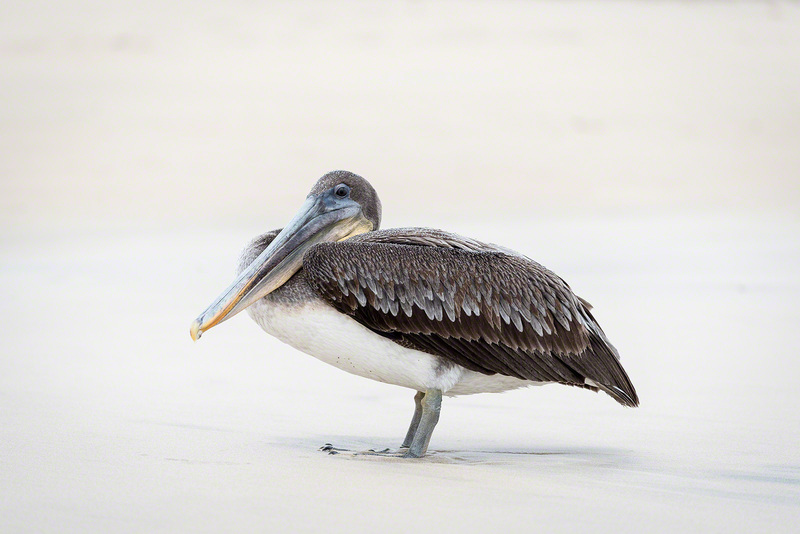 The Galapagos Islands are about 600 miles west of Quito. Ecuador ended up with the Galapagos Islands because no other country wanted them. Lucky Ecuador--tourism is one of the top 5 money makers for Ecuador. In addition to flowers, Ecuador's top exports are oil (hurting now with the price/barrel down prompting the President to increase taxes on foreign imports), bananas, shrimp, coffee, and cocoa. Our tour was a land-based tour of two islands as opposed to a yacht-based tour because we wanted to hike and explore the islands. Most US tourists see the Galapagos Islands from boats. Most Ecuadorian tourists visit on land-based tours. We took a very early morning flight from Quito to Baltra Island and from Baltra Island we took a 9-passenger plane to Isabela Island where a driver and our naturalist guide Ernesto took us to our hotel in Puerto Villamil. Isabela is the largest island in the Galapagos group. It is also the only island that has the equator running through it. That first afternoon on Isabela Island we snorkeled at Concha de Perla. The visibility wasn't great, but we floated above five spotted eagle rays that glided along below us. Later when we were walking along the pier, we saw another spotted eagle ray gliding in the shallows barely skimming the sand. Sea lions (they have ears and can walk on their front flippers unlike seals) are everywhere and firmly believe that the benches, piers, boats are for their use. The Galapagos Sea Lion is a close relative of the California Sea Lion who has the same personality traits. The beach in Puerto Villamil is a stunning two-kilometer stretch of fine, white sand. 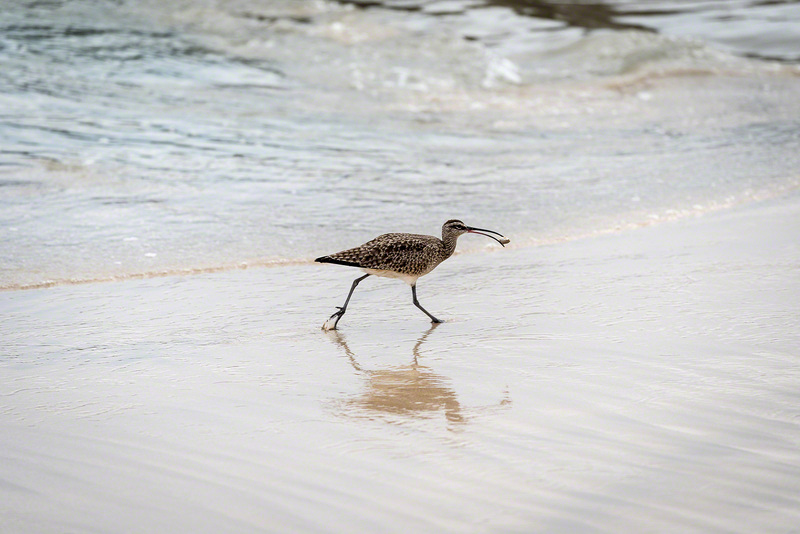 One day we walked the length of the beach amazed by the birds and animals that were unafraid of us. On Isabela Island, I was truly comfortable in my few days as a beach bum and fascinated by the patterns in the sand made by waves, or the footprints of birds, and my favorite the calligraphy of the ghost crab. The small, well tended Isabela Cemetery resides just across the path from the beach. 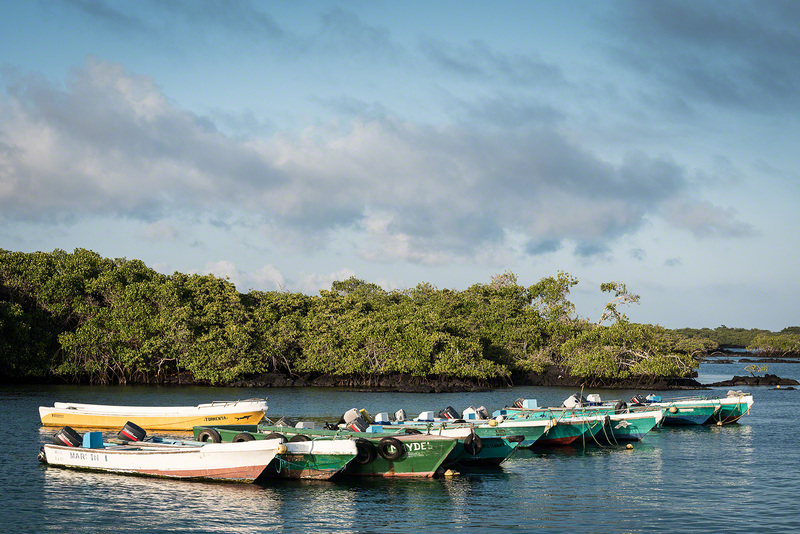 About 3,000 lucky people live on Isabela Island. Puerto Villamil is a small town with a collection of restaurants and shops along unpaved streets. 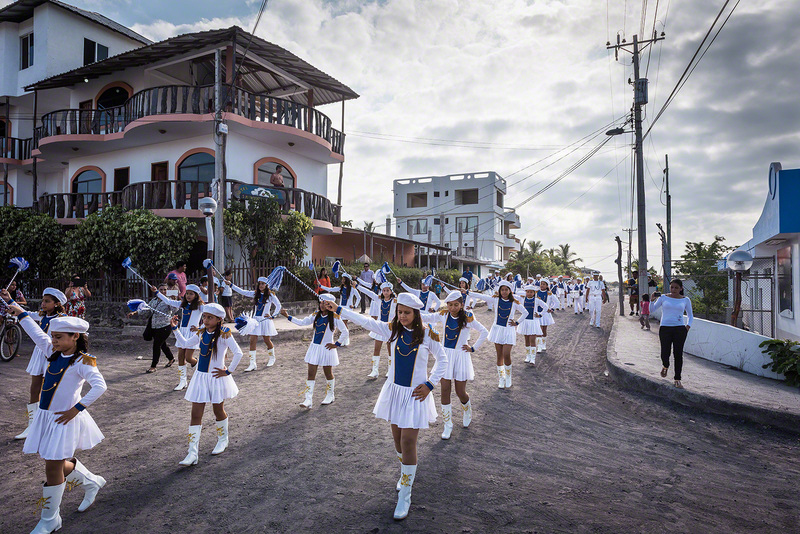 On our second day, a parade briefly prevented us from leaving town. 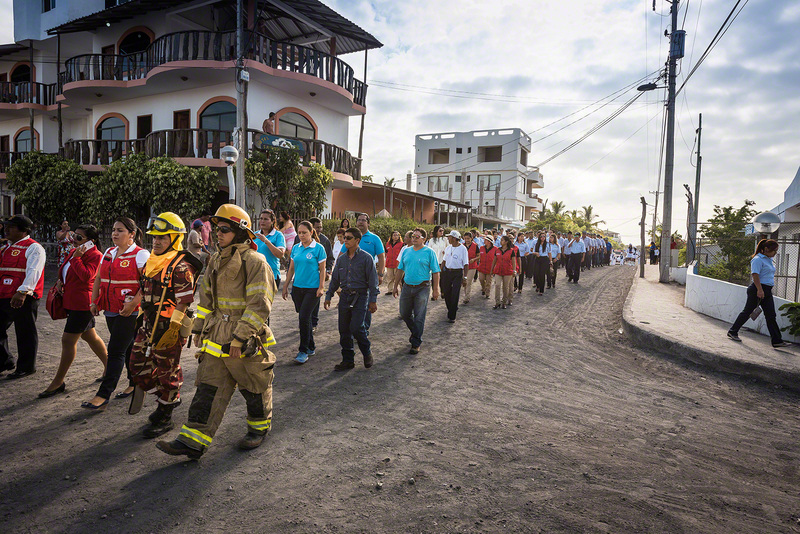 The parade was in celebration of canton status for the Galapagos Islands and for obtaining representation in Congress. About half of Isabela's population marched in this parade. 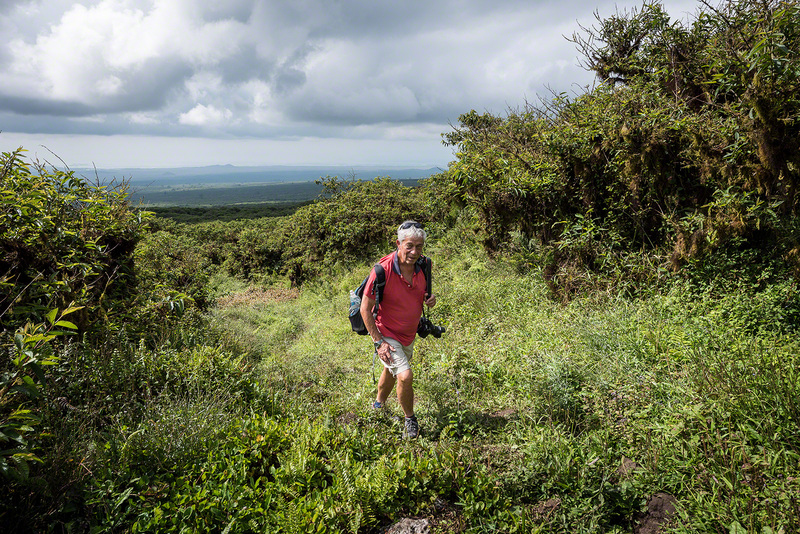 Then we walked up Sierra Negra volcano to the second largest caldera in the world. 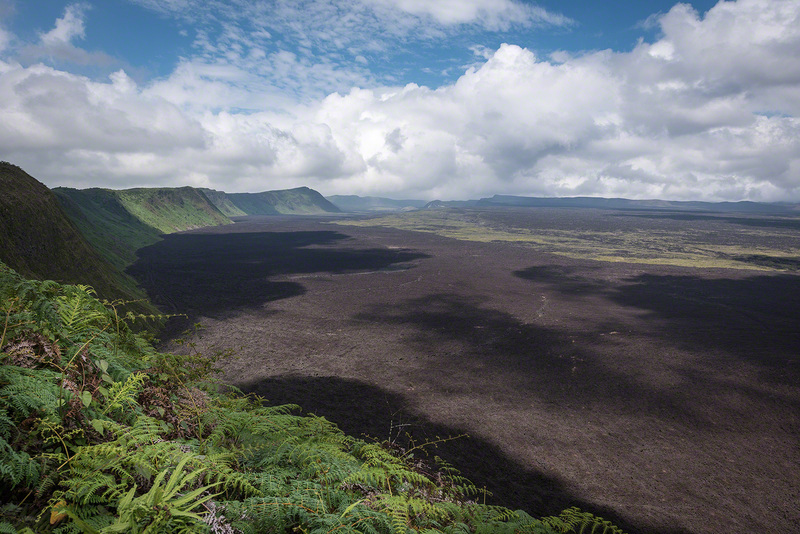 Sierra Negra is one of six volcanos on Isabela Island. From a distance, Sierra Negra is a gentle mound. 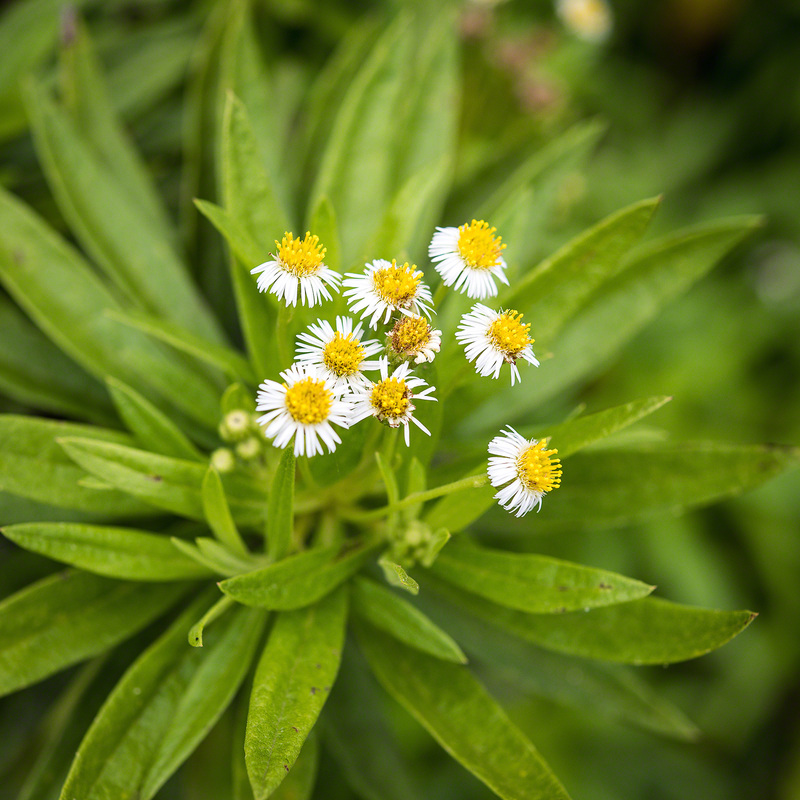 To the highest point around the caldera, Sierra Negra is 1490 meters/4,890 feet, but it is a hot, steamy walk through thick vegetation. Finally, the top, the 30-square mile caldera. The largest caldera in the world is Yellowstone in the US. We heard and saw yellow warblers, so many kinds of finches, and even the eye-catching Vermillion flycatcher. We walked behind a Galapagos rail family who scurried along the trail in front of us so quickly that I couldn't get decent photograph. We had another day or snorkeling. This time we took a small boat to a nearby chain of "aa" lava rocks that provide nesting grounds for marine iguanas. 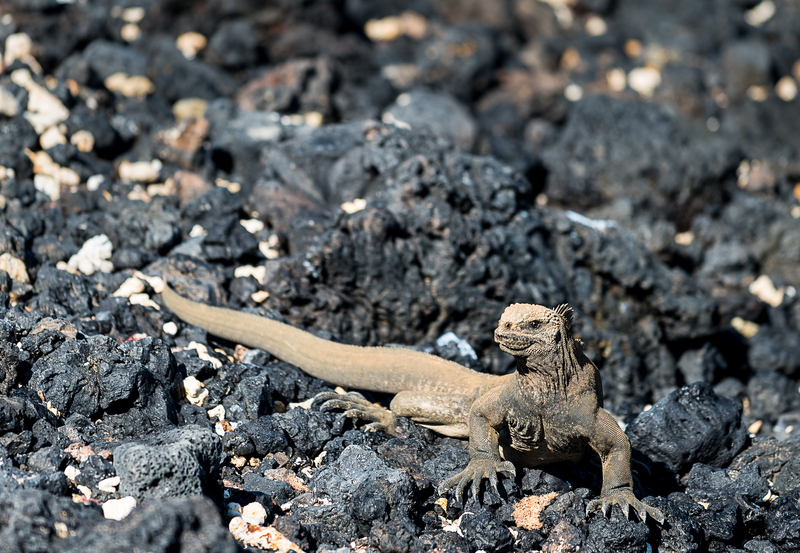 We saw a small fierce-looking female iguana, dirty and wrinkled with excess skin, who had just laid her eggs. She was covered with dust because she had just dug a nest for the deposit of her eggs. 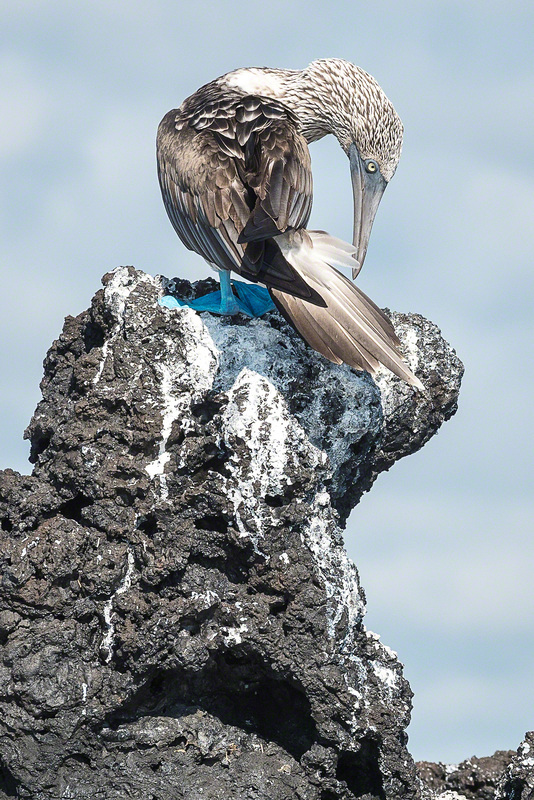 As the boat was nearing the snorkeling site, we saw Galapagos penguins sunning themselves on the rocks. The Galapagos Penguin is the northern most penguin and the third smallest in size. Since Isabela is on both sides of the equator, it is the only place in the northern hemisphere where it is possible to see a penguin in its native habitat. While snorkeling above a green Sea Turtle, a couple of penguins jumped in and swam and dived around us. White-tipped sharks sleep during the day in the channels between the lava walls. On our last afternoon, we (Ernesto and us) biked to the Wall of Tears. Along the way we saw flamingos and even a Galapagos Giant Tortoise along side the bike path. Isabela Island was used for a penal colony from 1946 to 1959. There were earlier attempts to house prisoners on Isabela and they always ended badly. This last time was no exception. As part of a sadistic punishment, the warden and guards forced prisoners to collect basalt rocks and use those rocks to build a wall. Prisoners had to search far and wide to find enough basalt rocks for the wall. If a prisoner dropped one of those heavy pieces of basalt 3 times, he was executed. Once the wall was built, the prisoners were told to dismantle it and begin again. Eventually, the prisoners rebelled and killed the warden and some of the guards. The prisoners then forced a villager to help them navigate to the mainland. The wall remains as a memorial to those who suffered and died from 1946 to 1959. In 1959, the Galapagos became a national park. Tomorrow we leave lovely Isabela Island behind and fly to Santa Cruz Island. Lunches at Casa de Marita are reasonably priced and very good. For dinner, we had a good meal at The Red Lobster (no connection to the US chain). It sits just a few yards/meters from Casa de Marita and just far enough from the other restaurants to have good service with no waiting.